Canada's new asbestos ban isn’t expected to come into full effect until late 2018, meaning that brake pads and linings that contain the toxic material could continue to be imported until then. Carmakers and domestic parts manufacturers stopped using the silicate mineral in brake pads and linings years ago. Asbestos mining ended in Canada in 2011. “Some people really thought it was something we had moved past,” says Jean-François Champagne, president of the Automotive Industries Association of Canada. Yet asbestos-as-automotive-component has remained stubbornly, silently persistent. It comes from offshore manufacturers, mainly in brake parts: between 2005 and 2015 Canada imported more than $100 million in asbestos pads and linings, according to one estimate. In December, after years of pressure from Canadian manufacturer ABS Friction, trade groups and the Unifor union that represents autoworkers, the federal government announced a comprehensive ban on asbestos imports and use by 2018. What took so long? In a word, money. As a world leader in its production, Canada was a prime promoter of the strong, fire-resistant material for products from insulation to gaskets to floor tiles. Even as other countries acknowledged thatexposure to asbestos particles could lead to the pulmonary disease called asbestosis and cancers such as mesothelioma, Canada and Quebec were funding the Asbestos Institute (later the Chrysotile Institute) to lobby on behalf of asbestos miners. By 1999 asbestos was listed as a toxic substance under Canada’s Environmental Protection Act and fell under federal and provincial controls. But it was not, as many had expected, banned outright. “There’s a general sense that, well, government’s looking after it; it’s being taken care of. So there’s a sense of complacency, and the public’s mind shifts to more salient concerns,” says Will Amos, an environmental lawyer and Liberal Member of Parliament for Quebec’s Pontiac riding. The controls couldn’t protect against unexpected events such as the 2008 Sunrise Propane explosion that rained asbestos over a Toronto neighbourhood, Amos says. Nor did they prevent the importation of asbestos brakes, clutches or other parts, or even require labels listing the mineral as an ingredient. Starting the ban immediately would not be possible logistically, Amos said. “The government, including right up to the key political decision makers, did everything they could to tighten the screws on the timelines ... but at the same time you do have to have a transition,” says Amos. The Automotive Industries Association, which includes jobbers and retailers, was an early advocate for the ban and had input on the timing, Champagne says. “It’s really part of AI’s corporate social responsibility to make sure that we provide a safe working environment for everyone involved in the aftermarket,” he says. Companies with asbestos in their inventories could take a financial hit when the ban takes effect, but Champagne believes many have already stopped stocking such parts. With more consultations planned to work out details, the ban isn’t expected to come into force until late 2018. Meantime, a parliamentary committee of which Amos is a member has launched a review of the 1999 environment act. That could offer hope to asbestos opponents who have urged the government to also ban heavy metals such as copper in brake pads and other products. The biggest risk from asbestos is to technicians taking apart and cleaning dust-caked brake assemblies. But the repair business, like other industries, has long had procedures to reduce exposure. Alberta’s Occupational Health and Safety Act, for instance, requires workers to use a HEPA-filter industrial vacuum to clean assemblies or wet them down with a low-pressure hose. Brake work is required to take place in a separate, designated area. 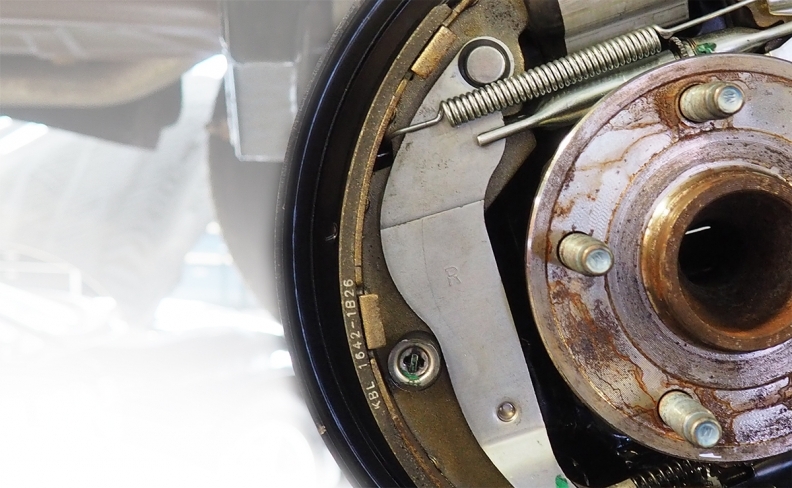 There likely mechanics who still reach for an air hose to clean brake parts, but Jason Glennon, coordinator of the motive power technician program at AlgonquinCollege in Ottawa, thinks the overall attitude has shifted. Dealerships have safety committees to monitor noise levels and the use of protective gear, and auto students learn about the value of precautions.